Taking an empty shell of a room and transforming it into a kitchen is a complicated task that needs careful planning if the new space is to be a success. 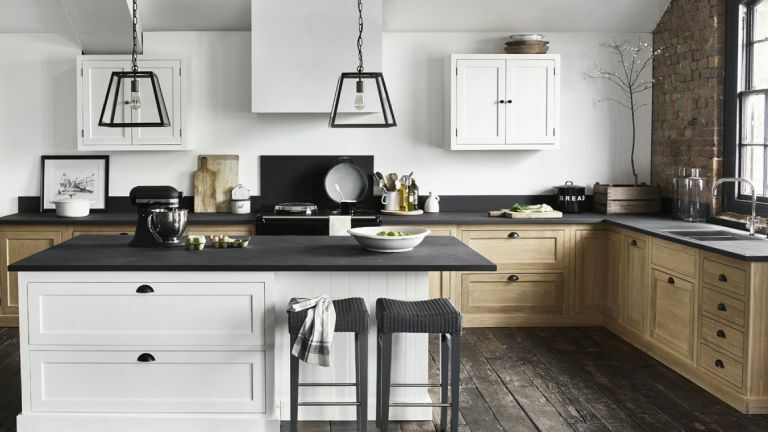 In this feature, we cover kitchen planning and budgeting, kitchen design, inspiration for your kitchen's look, and kitchen buying guides to take you through the process of not just planning a new kitchen from start to finish, but furnishing and equipping it, too. How you approach the planning of your new kitchen largely depends on the size of the room itself and the budget you have. Is yours an open-plan kitchen diner the whole family can gather in, are you designing a small kitchen to be space-efficient, or are you hoping to create a stylish kitchen on a budget? Is your kitchen part of a wider project, perhaps a whole house renovation or a kitchen extension? Use these guides below to start planning your kitchen's layout and main elements. Then go to page two for more detailed design advice and inspiration. Use this essential guide if yours is a simple transformation. You'll find kitchen planning and design advice, plus inspiration for your new room. Creating a kitchen in an open plan space requires more careful thought about the layout of the entire room. Find out how to approach it here. A small kitchen can be a gift: it forces you to design a space that's highly efficient and practical, but it can be good-looking, too. Find out how in our guide. Ensure you include the important main design elements of a country style kitchen to get this enduringly popular look just right. We show you how. If you love the idea of a retro look but want to bring a touch of country to your new kitchen, vintage is the perfect compromise. Use these tips to get started. Designing a kitchen on a budget needn't mean that it looks cheap. With the right approach, you can create an elegant space without the spend – here's how. Before you begin buying the elements you need for your kitchen, find out how to trim the cost of your project with our expert tips and advice. From the best splashbacks and choosing worktop materials to suit your space and needs to finding the best kitchen storage, we've got it all covered. Which design, finish and profile will suit your home and your personal style best? Which material? Which colour? Start your search here. A freestanding kitchen has a relaxed look that's really in vogue, but how to achieve a practical layout? We look at everything from larders to islands. If you have the space, a kitchen island can become the focal point of your kitchen; not just practical, this is a look-defining design element to get right. Which kitchen worktop material will suit your kitchen's look, but importantly, your cooking habits, too? We cover all every type to help you decide. From tiles to glass, resin panels to composite, we have splashback ideas and buying advice for every kitchen type and style, and everyone's budget. Considering making a range cooker, whether contemporary or traditional, the focal point of your new kitchen? Find out what you need to know before buying. Before you buy a kitchen appliance, whether a fridge freezer, oven, microwave or hob, check our buying guide to find the right one for your family's needs. It gets a real battering every single day of the week, so you'll want to make sure your kitchen sink is up to the job, as well as handsome. Use our expert tips. Modern kitchen taps don't just dispense hot and cold water – they deliver boiling (or near boiling), too. No kettle = more worktop space. Will one suit you? A vital part of planning your kitchen's new layout is getting the storage levels and elements just right. Our guide will give you a practical, tidy space.